What's the right action camera for you? There's more out there than just the best GoPro, in fact there's an abundance of quality action cameras from a host of different manufacturers, boasting a huge range of different features and specialities. We’ve tested hundreds of models, and we believe that the best action camera right now is the GoPro HERO7 Black. It packs in 4K video at 60fps, is waterproof to 10 metres without a case and debuts HyperSmooth, GoPro's all-new, gimbal-killing in-camera video stabilisation tech. You might want to take a look at our list of best underwater cameras while you're here. Ultimately though, determining the camera that's right for you will depend pretty heavily on what you plan to use it for. 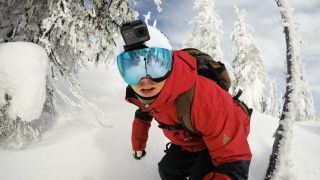 Whether you're a watersports enthusiast, an avid skiier or indeed an amateur filmmaker, your exact action camera needs are going to be different, and that means it's worth taking some time to familiarise yourself with the models that are out there. You might just be looking for the best cheap camera right now, but we also have guides for the best cameras for vlogging. You might get an action camera that's waterproof down to 30m by itself, or one that requires a housing, or indeed an action camera that isn't up to much in water but can take a serious battering without breaking. Maybe wireless functionality is most important to you, or you prize a camera that you can control via your phone using an intuitive app. GoPro is undoubtedly the market leader in pretty much every area, however its products do come at a premium price. Could you save a considerable amount of money by shopping around to see if what you're looking for is available at a cheaper price. Yes, you absolutely could! Whatever kind of adventurer you are, there's an action camera for you. In this article we've put together our top picks of the best action cams right now – and if you'd like to capture the action from the comfort of your car, here's our look at the best dash cams available right now. We can also show you some of the best GoPro accessories out there too. For anyone who thought the Hero6 Black couldn't be improved upon, GoPro gives you HyperSmooth, a brand new in-camera video stabilisation system that's so good that it awakens new creative possibilities. It even works up to 4K 60fps. Those using a gimbal on their GoPro can ditch it because HyperSmooth gives even handheld video a silky-smooth look. However, it also brings to life a new possibility; handheld TimeLapse video. Called TimeWarp, the Hero7 Black's new 2GB memory allows it to apply HyperSmooth to handheld frame-by-frame time-lapse shooting. As well as these super-stabilised hyperlapses, the Hero7 Black brings expanded dynamic range, SuperPhoto, and 12 separate voice commands. What’s not to like about the genre-defining GoPro HERO6 Black? Yes, it’s pricey, but the action camera's 4K video recording at 60fps video is hard to beat. That’s partly because of low-light performance that's been improved over the previous HERO5 Black, and some excellent image stabilisation to suppress camera shake, though there’s much more here to like than mere video quality. Voice activation is useful when you’ve got your hands full, and the natively drop-proof, waterproof design – to 10m without an extra housing – makes it insanely usable. So does the excellent Quik smartphone app, which comes with a QuikStories feature that automatically transfers and edits video for you. With features galore, the GoPro HERO6 Black is the best action camera around. Those who want the best-quality action camera typically go for the latest GoPro model. There’s only one problem with that: a high price tag. This much more affordable action camera from Yi Technology gives you almost as much bang for your buck. For example, it’s got a slightly larger touchscreen than a GoPro HERO6 Black, and matches its rival in recording 4K footage at 60fps. The results are detailed, smooth and colourful, and the user interface is both super-fast and super-simple. It doesn’t include a waterproof housing, nor does it have GPS functionality, but those features aside, the Yi 4K+ is a fantastic action camera. Though the Sony RX0 is a decidedly expensive prospect, the feature-set you get with it means it definitely merits consideration. Being able to shoot short bursts of video at up to 1,000fps is something not to be sniffed at – you certainly can't do that with a GoPro. While the RX0 is capable of producing 4K UHD footage, it can't do so internally and needs to be hooked up to an external recorder, which somewhat limits its efficacy as an action camera. The 1-inch sensor produces beautiful images, whether shooting stills or video, expands the camera's low-light efficacy and provides gorgeous dynamic range. It's an expensive proposition to be sure, but if you need gorgeous slow-motion footage then there's nothing better. It's just been updated with a new Sony RX0 II version that adds a tilting screen. The Olfi One.Five Black is a mild refresh of the Olfi One.Five and doesn't exactly reinvent the wheel, still topping out its 4K capture at a frame rate of 24p, but it does what it does well, and its attractive price point makes it a compelling proposition for those who don't want to pay GoPro-money for an action camera. Vertically oriented, the Olfi One.Five Black is great for clipping to bicycle handlebars, though its 30m waterproofing means it's also great for watersports. The built-in Wi-Fi allows you to take advantage of the Olfi app to control the camera from your phone – the functionality is basic, but works well. A solid inexpensive choice of action camera. The TomTom Bandit has all the core features, but they’re here offered in ‘lite’. For example, there’s no waterproofing, but an included splash-proof lens cover will be enough for most users (and a 40m-capable lens cover is available). Ditto the resolutions; 4K at 15fps isn’t great, and effective slow-motion can only be performed in less-than-HD resolution, but neither will be deal-breakers for most. However, the TomTom Bandit has GPS, accelerometer, gyroscope and pressure sensors, and these are used by the smartphone app’s ‘Create a Story’ section to automatically pick out the highlights from your footage. Better still, all it takes is a shake to create a compilation video, which is easy to upload and share. Battery life is also an impressive three hours. Designed to cope with the tough stuff, the 4K-capable Tough TG-Tracker is waterproof to 30m without a housing and can perform down to -10ºC. Not only that, but it’s drop-proof from 2m and even crush-proof to 100kg. A flip-out 3.8in screen makes it easy to see what’s being filmed, while an LED headlight makes night shots possible. What’s more, its suite of Action Track Sensors (for GPS, compass, accelerometer, barometric pressure, temperature and water) add data to video. A must-have action camera for those adventuring in extreme climates, this data-hungry, pocket-sized shooter’s only real weak point is its low-resolution photos. Taking more than a few cues from GoPro, the SJCAM SJ8 Pro provides plenty of the functionality of top-quality Hero cameras but at a significantly friendlier price point. It's not only got 4K footage at 60p, but this footage also benefits from six-axis image stabilisation, which really comes in handy in action-shooting situations. The standard GoPro-style mount allows the SJ8 to be mounted to anything you might want to mount it to, and there's also decent slow-motion if you drop the resolution down to 1080p or 720p. The waterproof housing is a little clunky in use, with a lever lock system that can be tricky to operate, but this is still a great option to consider, especially for the price. The key drop-down feature if you swerve the latest HERO6 Black in favour of the HERO5 Black is that the latter cuts the video quality from 4K at 60fps to 4K at 30fps, but whether this matters or not is your call. Other than that, it weighs the same and is also waterproof down to 10m, and has both Voice Control Commands and GPS. Oh, and the brilliant editing apps that help really GoPro standout from the crowd. There are, however, a few drawbacks. The image stabilisation isn't as refined as on the newer version, and the touchscreen can be fiddly to use, especially when it's wet. Those issues aside, the GoPro HERO5 Black remains a great action cameras that's better value now it's been superseded. Could you buy an action camera that only deals in Full HD resolution? The Garmin VIRB XE offers a compelling reason as to why you should. It’s waterproof to 50m without a case and can withstand temperatures as low as -10ºC, but this action camera isn’t just made of tough stuff. The Virb XE is also smart, with a suite of G-Metrix sensors that can measure GPS, compass direction, temperature and even speed, which adds an exciting layer of data to video. It can even get data from compatible ANT+ devices, such as heart rate devices and smartwatches. As a bonus, for those who think audio is just as important as video, a Bluetooth microphone can be attached to it.